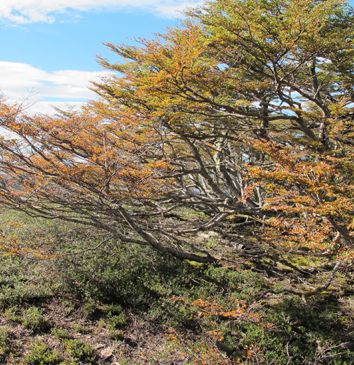 Climatic seasonality drives ecosystem processes and influences plant species distribution. However, there is little understanding how different aspects of seasonality (in particular temperature and precipitation) affect growth continuity of trees in climates with low seasonality because seasonality is often only crudely measured. This is particularly true for oceanic islands, where the density of climate stations often does not match the fine-scale spatial heterogeneity of topography and climatic conditions. Exceptionally wide elevational species distribution ranges on islands can allow the use of tree rings to identify how growth continuity and climate–growth relationships change with elevation. Distinct tree ring boundaries (TR) versus annual density fluctuation (ADF) in wood cores of P. canariensis from La Palma. (A) Magnified view on a tree core showing an ADF and a neighbouring distinct tree-ring boundary (TR) with abrupt stop of late-wood formation. 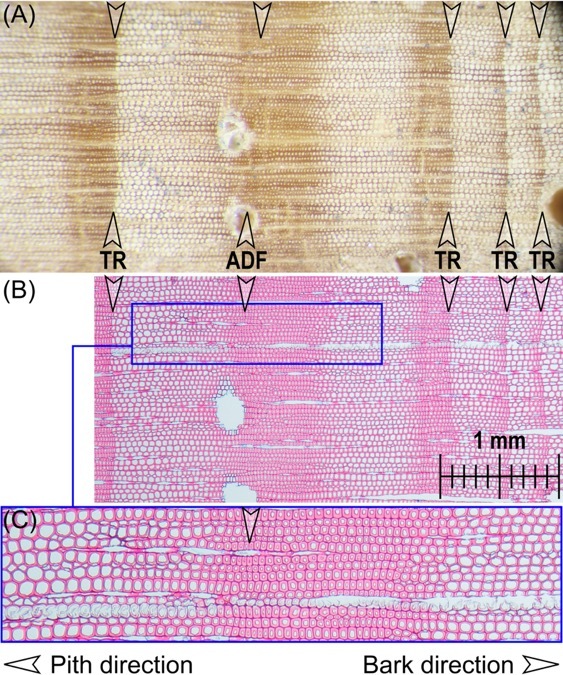 The late-wood formation of both ADF and TR have comparable dimensions. The ADF is followed by a clearly recognisable tree-ring boundary and two further tree rings with faint late-wood boundaries. (B) Thin section showing the same part of the tree core with (C) a magnified view of cell-size transition within an ADF. Arrows indicate the position of smallest late-wood cells where we finished one ring width measurement and started the next. Image credit: Loïc Schneiderf. In a recent study published in AoBP, Weigel et al. present a novel dendroecological method to measure stem growth continuity based on annual density fluctuations (ADFs) in tree rings of Canary Islands pine (Pinus canariensis) on the oceanic island of La Palma. The authors measured three decades of tree-ring data of 100 P. canariensis individuals distributed over 10 sites along the species’ entire elevational range (300 – > 2000 m a.s.l. The successfully implemented ADF approach revealed a major shift of stem growth continuity across the elevational gradient. The authors found a remarkably clear pattern that trees most often continue to grow year-round in the humid mid-elevation (approx. 1000 m a.s.l.) cloud forests of La Palma. 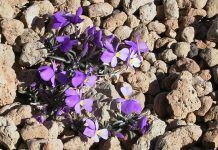 The authors conclude that ADFs are a useful method to measure stem growth continuity in low-seasonality climates. 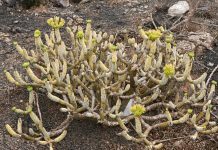 Growth of P. canariensis on the Canary Islands is more frequently interrupted by winter cold at high elevations and by summer drought at low elevations than in the trade wind-influenced mid elevations, where growth can continue throughout the year. 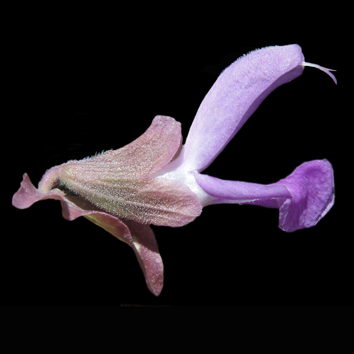 Climate change-associated alterations in trade wind cloud formation might cause non-analogue growth limitations for many unique island species. Robert Weigel graduated from the University of Bayreuth, Germany in 2015 (MSc Geoecology), where he investigated plant responses to extreme climate events under supervision of Professor Anke Jentsch and Professor Carl Beierkuhnlein. 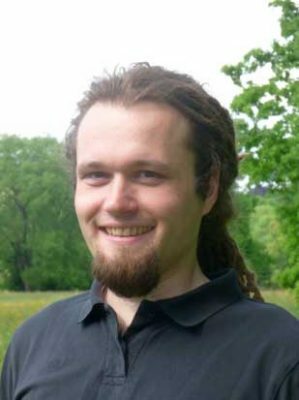 He is currently finishing a PhD at the lab of Juergen Kreyling (Experimental Plant Ecology) at the University of Greifswald, with a focus on forest ecology under climate change. 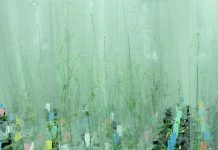 Robert is an ecologist with a broad interest in understanding plant responses to climate change. He uses a variety of methodological approaches (dendroecology, experimental plant ecology, vegetation analysis) to investigate ecological processes in forest ecosystems and how those processes change in time and space. Next articleBring on the birch!